Staying up-to-date with current trends is a key aspect of your role in the showroom. Knowing what people are looking for in terms of styles, colors and patterns can help you anticipate their needs, which in turn allows you to better serve them. To make sure you’re on top of today’s trends and expectations, here’s what customers are looking for when remodeling or planning a master bathroom. As bathrooms lean towards the practical and sensible, storage needs will only continue to grow. Design retailer Deane Inc. explains that custom-designed cabinets are popular because they allow people to create space for specific needs. This helps optimize the space and make the entire bathroom layout more efficient. Another trend in storage is hiding fixtures and shelving beneath minimalist cabinetry, Kristen Mucci at This Old House writes. Keeping fixtures concealed elevates the serene, spa-like feel of a space, which is what many homeowners are looking for when revamping their master bath. His and her vanities are another way that homeowners are seeking to make their bathrooms more sensible. For example, in a bathroom designed by Leslie Lamarre, a pair of sleek wooden vanities keep toiletries and hand towels discreetly tucked away. Because these vanities boast multiple drawers and shelves on each side, it’s easy to keep items organized and accessible. Practical showers are another essential aspect of sensible master bathrooms. Andrew Collins at Reno Assistance explains that open showers, and those with multiple functions, are especially popular in today’s master bath. Fixtures such as benches, steam systems, shelves and soap dispensers are all being prioritized because they make the shower experience more efficient and convenient. Today’s homeowners are also seeking showers that have linear drains, according to Lee Nelson at My Mortgage Insider. Instead of round center drains, linear drains follow the length of the shower floor for a more subtle appearance. The aesthetic element of linear drains works especially well for infinity showers with glass doors, because intricate tile floors can be emphasized without drawing attention to a center drain. Many of today’s homeowners are adding heated floors to their bathrooms. Warmly Yours, which equips homes with modern heating solutions, explains how electric floor heating is an easy-to-install bathroom element that has a major impact on a bathroom’s comfort level. When paired with floating vanities that leave additional flooring exposed, heated flooring has an even greater impact. In addition to being luxurious and convenient, heated floors make bathrooms much more comfortable in climates with cold winters. Normandy Remodeling adds that while these were once considered a splurge, heated floors are actually becoming more practical. This is in part due to the fact that floor heating technology has gotten smarter, which means that they can be programmed to be much more energy efficient than before. Another characteristic of modern master bathrooms is timeless style. Homeowners are prioritizing timeless looks over immediate trends due to an appreciation of older, more sophisticated themes that never go out of style. California-based Allen Construction says that natural stones in muted, classic colors are one design detail that never goes out of style and always looks sleek. Customers remodeling outdated bathrooms might be especially interested in timeless style, as this will reduce the need for future remodels. Yanic Simard, principal designer and owner of Toronto Interior Design, explains that contemporary and transitional styles have a neat, tidy and timeless appearance that many people enjoy. Characterized by clean lines and simple surfaces, contemporary transitional styles in the master bathroom often pair muted whites and grays with stones like marble and granite. One timeless trending bathroom fixture that seems to continue growing in popularity is the freestanding bathtub. Real estate journalist Michele Lerner writes that in master bathrooms with enough space, freestanding baths are making a comeback. Tubs that assume modern, sculptural shapes are particularly popular with high-end clients looking to enhance their master bathroom. Another reason that freestanding bathtubs are becoming more popular is because they support the work-life balance movement. 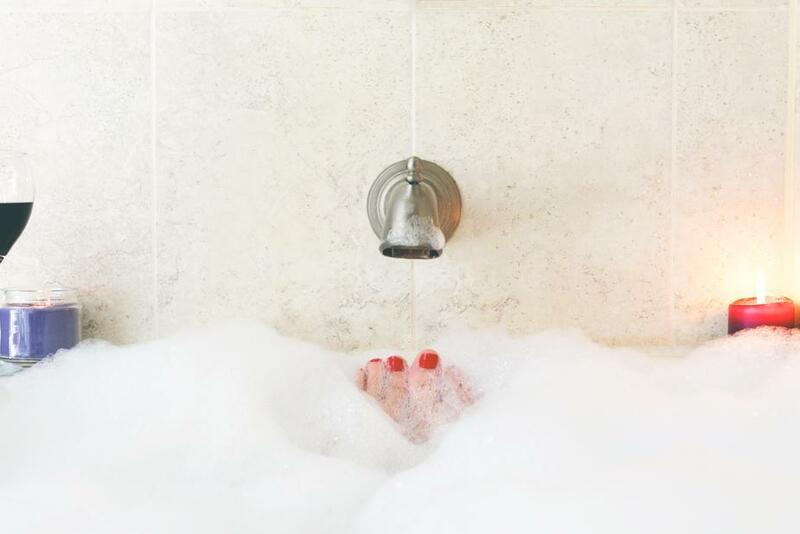 A hot bath is an easy way to practice self-care, interior design writer Christina Poletto says. Therefore, it’s important to keep this need in mind when customers are seeking to create a serene and inviting place to relax. With an elegant freestanding tub, their bathroom becomes a personal oasis for retreating from the busy day. The water closet is a normal aspect of life in Europe and other parts of the world, but has not been one that the US has fully embraced — until now. The water closet, where a toilet exists in a room on its own, is increasingly becoming a master bathroom requirement. This is partly due to the fact that people want their master baths to be more luxurious and spa-like, and hiding the toilet makes these spaces seem more tasteful. Design and installation company, Madsen Inc., says a water closet creates more privacy in the bathroom while enhancing the space’s functionality, allowing more than one person to use it at a time. Plus, the elimination of the toilet in the main bath emphasizes statement pieces, such as elegant freestanding tubs. While some customers may opt for timeless design elements, others may be more interested in incorporating trending colors and patterns. One of the most popular colors right now for master bathrooms is indigo, according to Ideal Home’s digital editor Amy Cutmore. This gem tone, inspired by the turquoise waters of tropical oceans, works well in master bathrooms because it exudes royalty and luxury. It pairs well with other luxe tones like purple and ivory. Customers are also starting to combine colors and patterns more often than usual. Instead of the all-white spaces of the past, today’s master bathrooms are a well-coordinated blend of mixed materials and colors. Sandy Spring Builders points out that some of the most popular materials include quartz and hand-carved stone. These are starting to replace granite, which used to be a top-tier choice. As for fixtures, both Sandy Spring Builders and Gates Interior Design agree that brass is getting big. Shiny brass might feel like the wrong move for people who saw this trend come and go in the 80’s and 90’s, but it can certainly be incorporated in a tasteful, modern way. Rose gold is a similar shade that’s taking master bathrooms by storm, and customers expect to have both of these options when shopping for faucets. To add gold and brass tones in a sleek way, Broadpoint Custom Homes suggests pairing them with a monochromatic color scheme. This lets the warm hues pop without being too overwhelming from a color or pattern perspective. Moreover, incorporating brass in the small details, such as the faucet or hangers or light fixtures, is a chic and subtle design decision. Chrome is also coming back, echoing the bold and shiny feel created by brass. 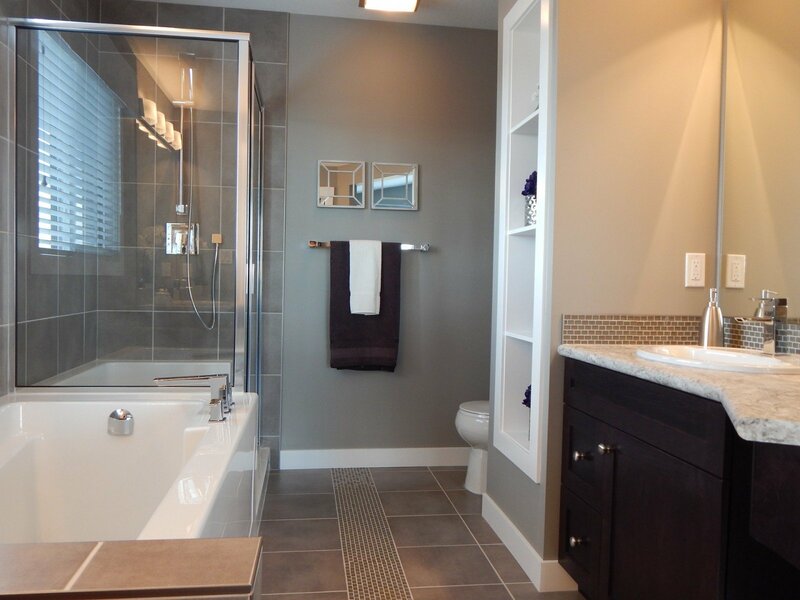 Custom builder Creative Homes shows how chrome can bring a sense of glamor into a bathroom, especially when its reserved to small elements like towel racks and faucets. Since chrome elements are often paired with quartz, expect customers to look for ways to combine these two materials.